The Giants’ final three years in New York City were unmemorable. They stumbled to third place the year after their World Series win, and attendance fell off precipitously. While seeking a new stadium to replace the crumbling Polo Grounds, the Giants began to contemplate a move from New York, initially considering Metropolitan Stadium in Bloomington, Minnesota, which was home to their top farm team, the Minneapolis Millers. Under the rules of the time, the Giants’ ownership of the Millers gave them priority rights to a major league team in the area. But the Washington Senators wound up there as the Minnesota Twins in 1961. 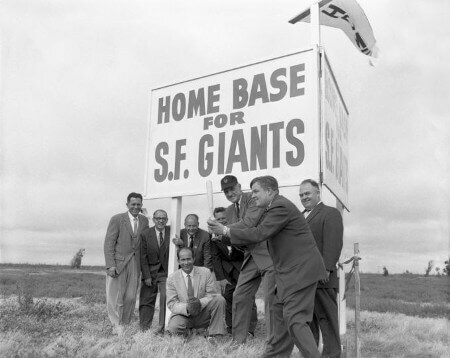 In 1960, the Giants moved to Candlestick Park sometimes known simply as “The ‘Stick”, a stadium built on Candlestick Point in San Francisco’s southeast corner overlooking San Francisco Bay. The new stadium quickly became known for its strong, swirling winds, cold temperatures and thick evening fog that made for a formidable experience for brave fans and players. Its built-in radiant heating system never worked. Candlestick’s reputation was sealed in the ninth inning of the first 1961 All-Star Game when, after a day of calm conditions, the winds came back and a strong gust appeared to cause Giants relief pitcher Stu Miller to slip off the pitching rubber during his delivery, resulting in a balk and a baseball legend that Miller was “blown off the mound”, although the National League won anyway. Two All-Star Games per season were played from 1959 to 1962. 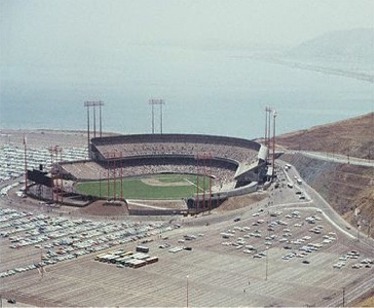 Candlestick Park was frequently beshrouded in fog, both inside and out, coming in from the Pacific Ocean seven miles to the west (through what is known as the “Alemany Gap”, a wide gorge ocean winds come through in lieu of major topographical obstacles). A foghorn was eventually situated and sounded inside the stadium between innings, adding to Candlestick’s already notorious meteorological reputation. Winds would whirl around in the parking lot at other times while it would be calm inside the stadium. Even with its cold, windy and foggy reputation, it stood its ground when the ground below it shook violently just before the scheduled start of Game 3 of the 1989 World Series. At 5:04 pm, the Loma Prieta Earthquake shook the San Francisco Bay Area during the pregame ceremonies. For 15 seconds the stadium rocked, and it was feared that one or more of the huge overhead light towers might fall on spectators in the stands; but only minor injuries were reported and the stadium’s structure was deemed safe ten days later. In 2000, after forty years, the Giants bade farewell to Candlestick Park and, as long advocated, moved into a privately financed downtown stadium (AT&T Park, originally Pacific or “Pac” Bell Park and later renamed SBC Park) on that part of the shoreline of China Basin known to Giant fans as McCovey Cove, at the corner of 3rd and King Streets (with an official address of 24 Willie Mays Plaza in honor of the longtime Giant superstar), ushering in a new era for the Giants and their fans. While Candlestick resembled the multi-purpose concrete-dominated “cookie-cutter” parks built by so many teams during the 1960s & 1970s, their new home is regarded as one of the most beautiful venues in all of professional sports. Even so, as part of the intense rivalry with the Los Angeles Dodgers, some Dodger fans derisively and jealously refer to AT&T Park as “The Phone Booth” from its current and former names (Pac Bell Park, SBC Park), as could be expected. The 2010 World Series was the 106th edition of Major League Baseball’s championship series. The best-of-seven playoff, played between the American League champion Texas Rangers and the National League champion San Francisco Giants, began on Wednesday, October 27, and ended on Monday, November 1, with the Giants winning the series 4–1 to secure their first World Series championship since 1954 and their first since relocating to San Francisco from New York City in 1958. 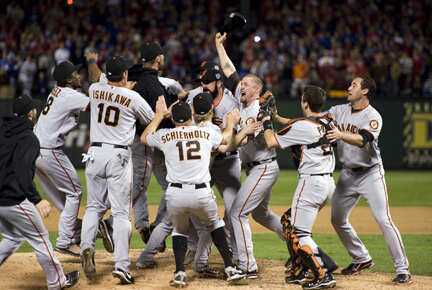 The 2012 World Series was the 108th edition of Major League Baseball’s championship series. The San Francisco Giants, the National League champion, won the best-of-seven playoff in a four game sweep over the American League champion Detroit Tigers. 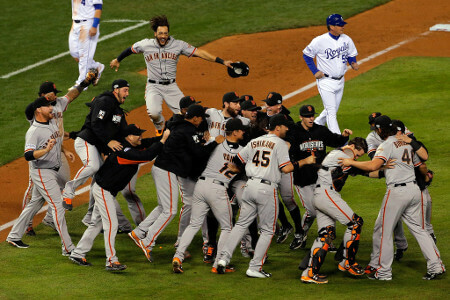 The 2012 title marked the Giants’ seventh World Series title in franchise history, their second in San Francisco (the New York Giants won five), and their second in a three-year period (2010 – 2012). The 2014 World Series was the 110th edition of Major League Baseball’s championship series, a best-of-seven playoff between the National League champion San Francisco Giants and the American League champion Kansas City Royals. The Royals had home field advantage for the series as a result of the American League’s 5–3 victory in the All-Star Game. The Giants defeated the Royals, 4 games to 3, to clinch their third World Series championship in a five-season span and their third overall since their move to San Francisco from New York. This was also the Giants’ eighth World Series championship in franchise history. The San Francisco Giants are an American professional baseball franchise based in San Francisco, California. Founded in 1883 as the New York Gothams, and renaming three years later to the New York Giants, the team eventually moved to San Francisco in 1958. 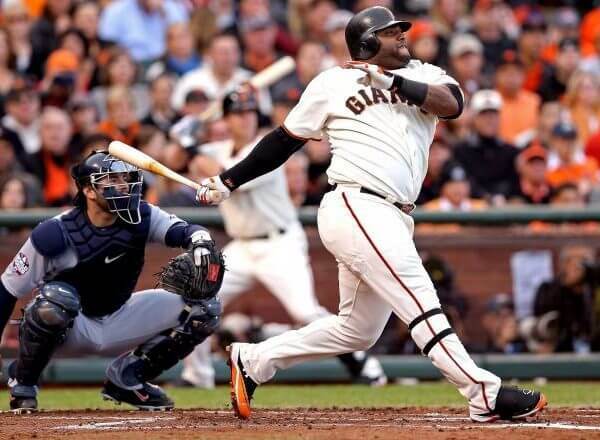 The Giants compete in Major League Baseball (MLB) as a member club of the National League (NL) West division. Who is the greatest San Francisco Giants?